You can burn your documents, photos and other data from the source computer onto a DVD or copy it to a USB Flash drive or an external hard disk and then transfer (copy) the file to the destination computer by simply copying from the DVD or plugging in the external storage device. One major set-back with the USB Flash drive and external hard disk is that they are not NTFS. They are usually formatted as Fat32, which limits you to file size of 4 Gigabytes. Some people will not be affected by this limitation. If you use Outlook, and you have a lot of emails you may be affected by this because by default Outlook uses 1 PST file for all of its contents; mail, calendar, contacts, tasks, etc. Using a USB to IDE/SATA adapter is a great way to move data from one computer to another. With this option you need to open up the source computer to access the hard drive. Once you have taken out the hard drive you connect the USB to IDE/SATA adapter to the source hard drive and power connector. Power up the adapter and plug it into a USB port on the destination computer with the destination computer already booted up. The destination computer will see a new USB device attached and allow you to browse the source hard drive. Just browse to where your data is located and drag and drop or copy and paste to the location on the destination computer. You do need to know how to take out the hard drive from the source computer and you need to know how to browse the source file structure to move your data over to the destination computer. Transfer Files from one computer to another via USB cable is another very simple option for transferring data and settings between computers using the USB data cable. The cables are pretty cheap, work even with old computers and you can transfer any amount of data in one go unlike CDs or USB Flash drives where you are limited to the capacity of the drive itself. Another advantage – USB to USB transfer is a faster solution since you eliminate that extra step of writing data to a temporary storage [CD or USB Drive] before moving it to the final destination. While any USB to USB data cable available on eBay would do the job, you may want to invest in the Easy transfer cables that can transfer data from Windows XP-based computer to the PC running Windows Vista or from Windows Vista to a Windows 7 computer using the built-in Windows Easy Transfer program. 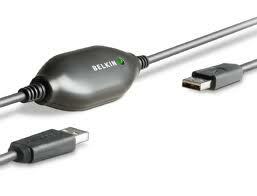 Belkin is one such vendor of Easy transfer USB cables that can transfer up to 30GB of data in 1 hour. If you are using a USB Flash drive to transfer data, you may want to download a program that can synchronize folders as well. If these options sound too involved or you just don’t want to take the time to transfer your data from one computer to another yourself you can always call us, Integrity Computer Concepts.